The BLASTN (BLAST "nucleotide") algorithm is used to auto annotate sequences. Select which folders to auto annotate against. Search according to a stringency; so for example you can run the auto annotation to detect sequences in your project with less than 100% match to those in the library. This will allow you to infer annotations on sequences which are "similar to.." other sequences in the library. Select "Auto Annotate" and the results will appear in the project. 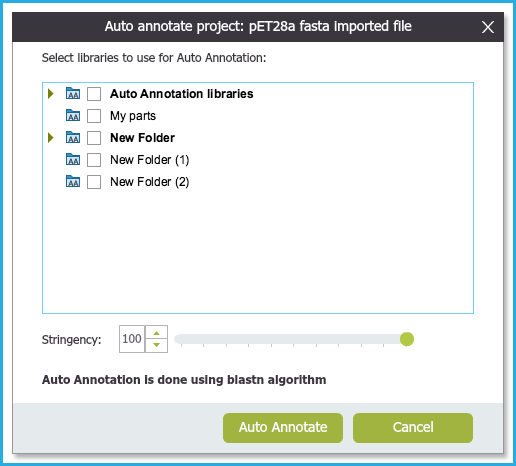 Figure 1.25.4.1: Auto annotation Settings Dialog. The first step within the settings dialogue is to select which folders/libraries to auto annotate against. 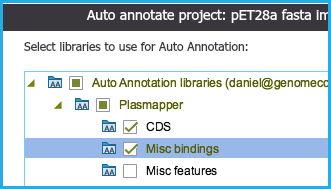 You can select from our internal library taken from "Plasmapper" and/or any other custom libraries which you created. Use the checkboxes to select or deselect folders. You can also select sub-folders (Figure 1.25.4.2). Figure 1.25.4.2: Selecting sub-folders for auto annotation. The next step in the settings dialog is to set the annotation stringency you would like to apply (Figure 1.25.4.3). Setting a 100% stringency will return annotation results whereby the sequence in the library and the project is exactly the same. annotations and functions of the sequence. Figure 1.25.4.3: Setting auto annotation stringency.